First Line: I turned my water glass in the slick circle of condensation on the smooth red lacquer of the table between us and studied the man across from me. At the end of The Western Star, we learned that Sheriff Walt Longmire's daughter, Cady, had been kidnapped by the head of one of the most vicious drug cartels in Mexico. Now in Depth of Winter, he must head south to save her before she's auctioned off to his worst enemies. He's traveling light and traveling fast. The American government is of limited help and the Mexican one even less, so it's one man against an army in the brutal 110° heat of the Mexican desert. If you're a Longmire fan who's not happy unless Walt is firmly ensconced amongst his friends and they all have an equal part in the action, you won't like with Depth of Winter. This is a one-man show, and characters like Henry and Vic play very limited roles (although I did love Henry's). Me? I'm the type of Longmire fan who'd follow Walt willingly into any one of my own circles of hell (which include rooms of long-haired cats and/or screaming babies), let alone his. I trust Walt to get me out alive and show me a good time while he's doing it. One of the reasons why I was looking forward to this book was the fact that I'm used to Walt chasing bad guys in the depth of winter on his home turf, with howling winds, blizzard conditions, and snow up to his eyebrows. In Depth of Winter, he's facing an entirely different beast: winter in the desert of northern Mexico, and I wanted to see how he'd deal with blinding sunlight, blazing heat, and not a drop of water around. Walt is a Man On A Mission, so he deals with it as only he can. Since he's got Henry and Vic handling things for him elsewhere, he manages to scrape together a motley crew to help him down in Mexico, and the rescue of Cady is one wild ride that only someone like Craig Johnson can put together. Walt is a man who goes out of his way not to kill people, but folks down in Mexico keep telling him, "Kindness to a killer builds coffins." 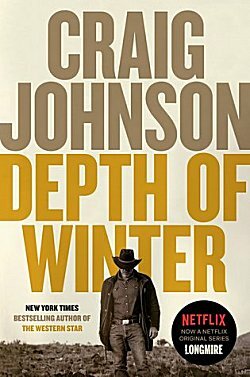 After a grueling trek through the desert and coming face to face with "that kernel of madness" he keeps buried deep inside, the finale of Depth of Winter is explosive-- and satisfying. Once again, I find myself in a familiar place-- all caught up with the series and waiting for a new adventure with Walt. Some authors just don't write fast enough, you know? Yes, we do. I'd be lying if I said I didn't prefer Walt to be with his buddies, but I am willing to follow him wherever he goes and with whomever he happens to travel with. I think it gives us a more complete picture of the character. I didn't lilke this one at all. I discovered that without Henry, Walt isn't a very charming or interesting person. This one was way too violent and I lost track of the body count and beatings, all lovingly described. I don't necessarily behave the same when I'm not in my circle of friends either. I think Johnson is allowing us to see Walt as a complete person-- and no one is ever charming or interesting all the time. I'm glad you left a comment. No two people ever read the same book, and it's good to see other points of view. Thank you! It was definitely different. There were times when I thought, "You idiot! What are you doing?" But it was interesting watching him having to rely on people he wasn't entirely sure he could trust. And considering the fate of the auctioned, it was probably better he didn't wait for the cavalry. I enjoyed it. The very last bit was just a bit confusing because of his state of mind, but the way he ends up leaving the hospital is hilarious. Yes, it was-- and I absolutely loved what happened to people who showed up looking for Lola!